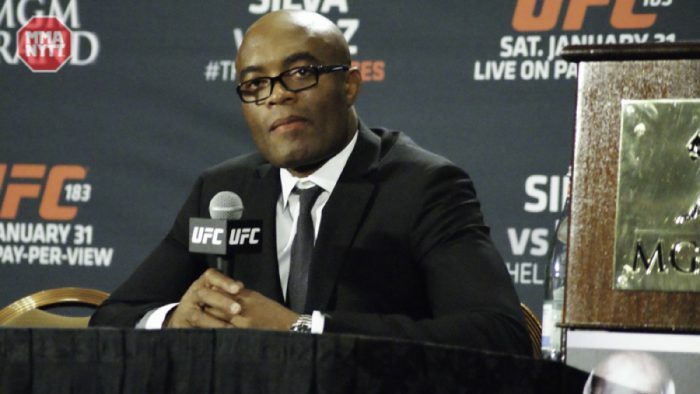 Former UFC middleweight champion Anderson Silva has released his first statement after being pulled from his fight against Kelvin Gastelum due to a potential doping violation from USADA. In the statement released via social media, Silva doesn’t disclose any information about the drug test that was flagged or even that he was pulled from the fight. Instead, Silva focuses on a message that ends with the 42-year old Brazilian vowing to fight again because fighting is what he loves to do. “Obviously, I think everything is part of a process of evolution with each passing day, I can learn more about who I am. I’m here to thank all my fans, especially my coaches and all the contributors for this long journey,” Silva wrote. “I can’t express my feelings and how sad I am because we all invest love, passion and time into this camp. I don’t know exactly the plans of God for me, but anyway, I can only thank him and all of you for the love and affection. Nothing is more gratifying at this moment than having you by my side. Silva was placed on a provisional suspension after being flagged by USADA, which forced the UFC to pull him from his fight with Gastelum that was scheduled for next weekend in Shanghai, China. In his place, former middleweight champion Michael Bisping stepped up to face Gastelum in the new main event for the card. As for Silva’s current situation with USADA, he still hasn’t revealed what substance was found in his drug test so there’s no telling what sort of punishment he might be facing if found guilty. USADA is not allowed to reveal details of a drug test unless that athlete releases that information first or until the end of the adjudication process. Silva could potentially be facing a much stiffer penalty because this would be the second time in his career that he’s tested positive for a banned substance. Silva previously faced a one year suspension following his fight against Nick Diaz when he tested positive for two different anabolic steroids as well as a pair of anti-anxiety medications. There’s no word yet on how long the adjudication process will take to play out before any resolution for Silva is revealed.